Hard Rock Hotel & Casino Atlantic City and Local 54 of the UNITE HERE! labor union have successfully negotiated a unionization contract for more than 1,780 hospitality workers at the Boardwalk resort, the Press of Atlantic City reported Friday. Talks over union representation for Hard Rock Atlantic City’s employees lasted more than six months. The New Jersey State American Federation and Congress of Industrial Organizations (AFL-CIO) spread the news of the fruitful end of the negotiations in a Friday statement. AFL-CIO further said that the bargaining committee will recommend ratification of the contract next Thursday. Including Hard Rock Atlantic City’s staff members, UNITE HERE! Local 54 will be representing more than 10,000 people occupying hospitality positions at Atlantic City’s operational casinos. The labor union’s members include bartenders, servers, cooks, and housekeepers, among others. Hard Rock Atlantic City opened doors this past June at the site of the former Trump Taj Mahal. The Hard Rock property’s predecessor closed in the fall of 2016 after a dispute between Taj Mahal owners and Local 54 that resulted in workers picketing the venue for more than three months. The hotel and casino resort was owned by New York activist investor Carl Icahn at the time. Mr. Icahn blamed Trump Taj Mahal’s closure on the prolonged strike. Local 54 is also set to bargain the unionization of Ocean Resort Casino employees. The property opened on the very same day as Hard Rock Atlantic City at the site of the former Revel. Last month, the New Jersey State Board of Mediation approved the authorization cards signed by 74% of Ocean’s eligible workers to signal their intent to unionize. Local 54 and Ocean Resort Casino officials began contract negotiations last September, but the labor union has said that it was always their “objective to get Hard Rock’s contract done first,” bearing in mind the casino’s previous labor union dispute. Now, as negotiations with Hard Rock Atlantic City have been completed, the labor union is likely to move on to Ocean Resort Casino. The labor union will represent 1,300 hospitality employees at the Boardwalk resort when the unionization contract is bargained. Local 54 President Bob McDevitt has previously said that casino owners have “acted in good faith” and that the labor union was looking forward to sitting down at the table with them. Mr. McDevitt has also expressed his satisfaction with the “overwhelming” percentage of workers who favored the unionization effort. 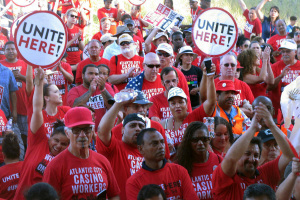 The post Local 54 Reaches Deal on Hard Rock Atlantic City Workers Unionization appeared first on Casino News Daily. A key provision in the agreement between the Seminoles and Florida from 2010 expired nearly five years ago. Legislative leaders and tribal officials have been trying to renew that portion of the compact since then, but with little success. Under the original agreement, the Seminole Tribe annually contributes hundreds of millions of dollars in casino revenue to the state in exchange for exclusivity over blackjack. Although their previous deal expired years ago, Florida’s former Gov. Rick Scott successfully reached an agreement with tribal officials that the tribe would keep sharing revenue with the state. However, that deal is set to expire at the end of May, which means that Florida could lose nearly $350 million in additional revenue this year. The state Senate has removed the Seminoles’ annual payment from the upper chamber’s proposed budget for the next fiscal year to prevent any huge financial damage from a potential failure to negotiate a new compact. Previous attempts for a deal to be reached even ended up in court. In 2016, a federal judge sided with the Seminoles in their claim that the state violated the terms of the 2010 compact that granted it exclusivity over blackjack by allowing pari-mutuels across Florida to offer the so-called designated player games. The tribe threatened to stop its payments to the state back then, but Gov. Scott managed to make peace with tribal officials. Senate President Bill Galvano told local media outlets earlier this week that behind-the-scenes talks were being held, but nothing solid had been agreed upon yet. It is understood that Sen. Wilton Simpson, who has been pitched as the successor of the current Senate President, has taken the lead in the ongoing gambling compact negotiations. Mr. Galvano told media that Sen. Simpson has met with tribal officials earlier this week to discuss the terms of a potential new deal. It is also important to note that gambling expansion will be approached differently from this legislative session on. Florida voters approved last November a constitutional amendment that gave them the final say over practically every gambling-related matter discussed in the Legislature. The post Florida Lawmakers, Seminole Officials Hold Talks over New Gambling Compact appeared first on Casino News Daily.